To cloister someone is to remove and isolate her from the rest of the world. Something that is inconspicuous does not attract attention and is not easily seen or noticed because it is small or ordinary. A misnomer is a name given to someone or something that doesn’t quite fit, or is inaccurate in some obvious way. A pseudonym is a fictitious or false name that someone uses, such as an alias or pen name. If someone or something is unobtrusive it means that it is not easily noticed and does not stand out in any way. To avoid his angry stepfather Big Bubba Lump, Harrison wore a man wig and sunglasses, traveling in disguise or going incognito throughout his hometown. Luckily, Harrisons neighbors knew that he was altering his appearance to remain hidden from Big Bubba Lump, and they helped keep him incognito by calling him “Stu” in public. Even though Big Bubba Lump had a restraining order against him, his actions were unpredictable and oh-so dangerous, so remaining incognito or concealed seemed like the safest thing to do. Quiz: Try again! What does it mean when someone is going about incognito? That person adopts another identity or alters his or her appearance. That person doesn’t deal well with close relationships. That person tends to make others mad at him for various reasons. Someone who is going around incognito is using a false name or has changed his or her appearance in order not to be recognized. Not Into Recognition Albert was not into recognition, so to keep other people from recognizing him he would always go about incognito. Someone goes about incognito because he “doesn’t” want to be “known” by others. 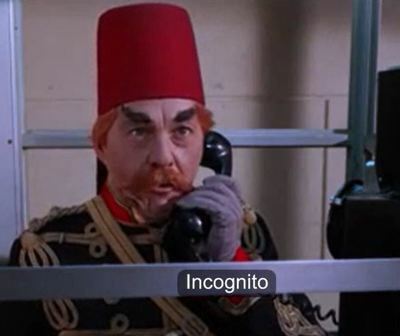 Batman The man who is going to go incognito is the same man who is speaking on the phone!